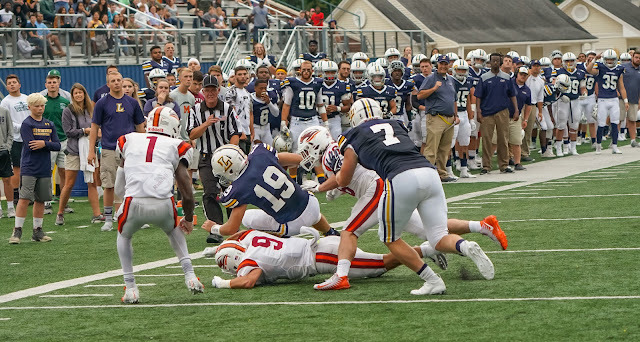 Lycoming offensive line opening a lane for Jr RB Keith Batkowski. Williamsport, PA - Was it an omen, the very first play of the game? Off sides on the kickoff! Did it forecast one of those games that is an anomaly? We think so. When things go wrong, it is like a snowball going downhill. it gains in size, and it is very hard to stop. That was Saturday's game against the River Hawks. Fr QB Elijah Shemory scrambles for good yardage. We watched the Warriors scrimmage Franklin and Marshall about nine days ago. Fr QB Elijah Shemory lead the team that day with pinpoint passing, good ball handling and showed leadership qualities. We watched Jr RB Keith Batkowski pound yardage in that contest. 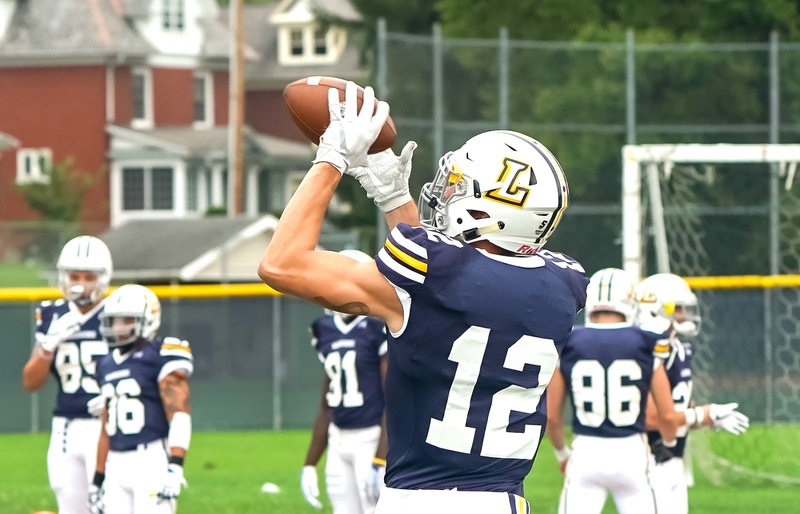 Lycoming has a more mature offensive line this year. And the defense, on paper, seems to be a step up from last year. So who would not be surprised by Saturday game results. Sr DB Joe Pinzka goes after Susquehanna's Jr RB Aaron Speight. 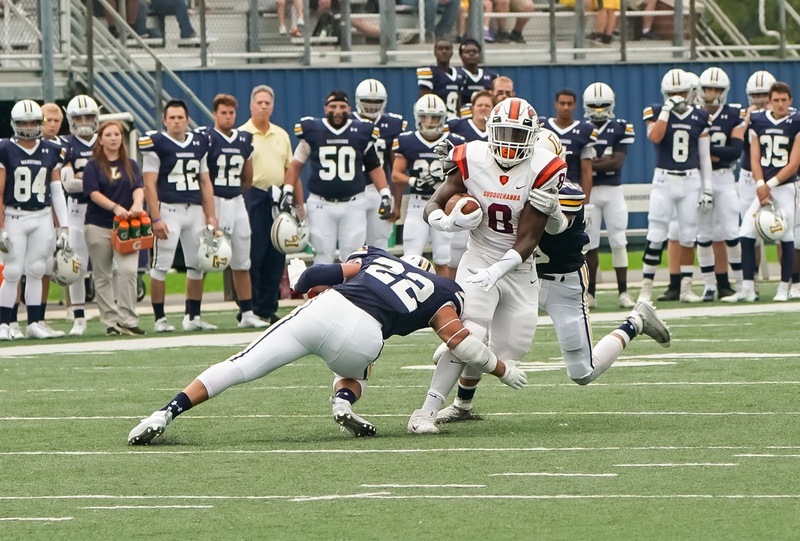 We also know that Susquehanna is a very good team, especially on defense. They lead the Centennial Conference last year in defense and have nine returning letterman this year. And their Fr QB Michael Ruisch had a dream opening game against the Warriors. All of this said, Lycoming did not play well. Sr WR Nick Costello warming up for the game. So what is the attitude of the team right now? Team captain Nick Costello expressed his feelings. "We're not going to let these three hours define our season (Sun-Gazette - Mitch Rupert)." And that attitude will need to filter through the locker room this week, because on the horizon is Widener who lost to a annual opening game rival Rowan. The Warriors lost last year in Philadelphia 31-17. We think these first two games will be a yardstick to what the Warrior team has to work on headed into conference play. 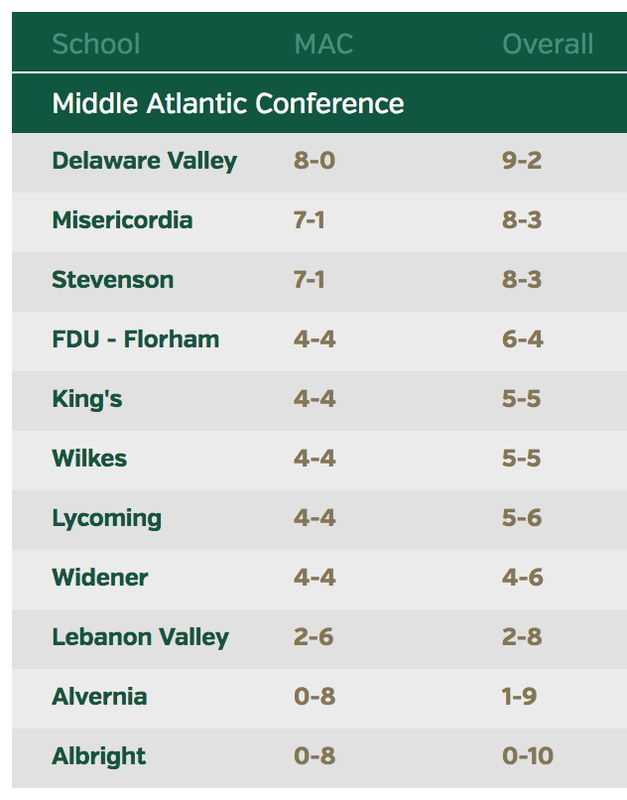 Because there are 11 teams in the MAC this year (Alvernia is the new kid on the block) Widener is considered a "Non-Conference" game for the record. I don't proclaim to understand how that was derived, but that is what I have learned. So Head Coach Mike Clark and the team have another week to sort things out, lick their wounds and set the ship in the right direction. We also think you will see a much better team this coming Saturday against the Pride. It all depends on the character of this 2018 Warrior squad. Adversity can be a good thing because it defines the character of each player. We know how team captain Nick Costello feels and we know his character. We will see how others react this week in preparation for the trip to Philadelphia.